Photographer(s) Appreciation: Thanks once again to Gary Nored@Flickr for sharing one of his images from the Chihuahuan Desert (original). Be sure to also visit Gary's weblog, aneyefortexas. Much like yesterday’s Alaska blue-eyed grass which is primarily found in another region (British Columbia), this species has a common name of “glory of Texas” or Texas pride. It has long been in cultivation, as evidenced by discussion in this 1843 work: Abbildung und Beschreibung blühender Cacteen; figures des cactées en fleur, peintes et lithographiées d’après nature avec un texte explicatif, par Louis Pfeiffer et Fr. Otto. (text (as Echinocactus bicolor), illustration). Unfortunately, as today’s photographer notes: “[it is] Infrequent even in its preferred habitat, it has been made even rarer by unscrupulous cactus thieves who sell them to collectors who prize them highly.”. 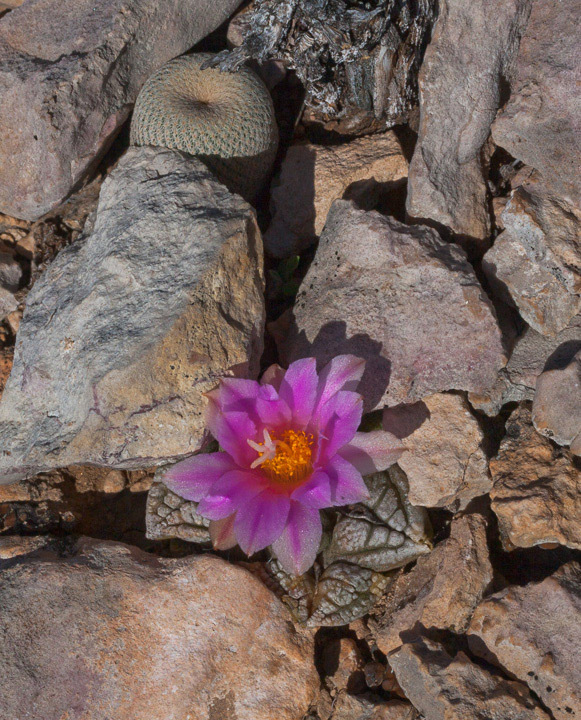 As one might expect in a Texas dryland, Thelocactus bicolor grows in “xerophyllous scrub on gravelly soils of hills and alluvial fans in desert or grassland”. Sorry to read about its rarity, especially since it’s caused by us. Your comment on Cactus Thieves reminds me of the Korean plant smugglers who were caught in Trinidad, CA stealing Dudleya succulents. My cousin who lives in Ferndale sent me the news article a couple of months ago. We used to joke about our CSSH group that you had to pat us down after we visited a garden, but these kind of thieves are motivated by greed. A local cactus thieving ring was recently apprehended and are now in prison. They had stolen over 3000 Ariocarpus fissuratus (Living Rock) cacti which the community is now trying to get re-established in suitable habitat. 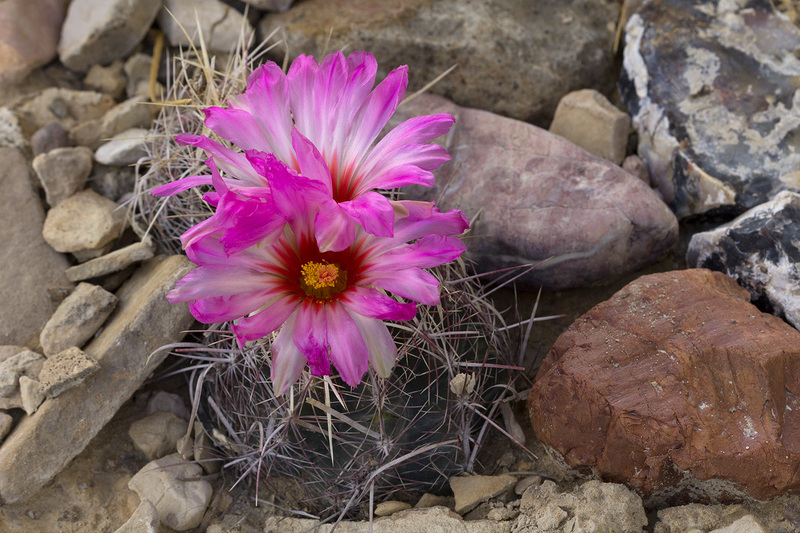 Though perhaps not as spectacular as Pediocactus nigrispinus (thanks, Susan), visitors are always excited to find one. Unless blooming, they can be difficult to spot. Here’s a photo of the plant in bloom. There is no need to dig plants up. They grow easily from seed and usually seed grown plants look better than ones from habitat!